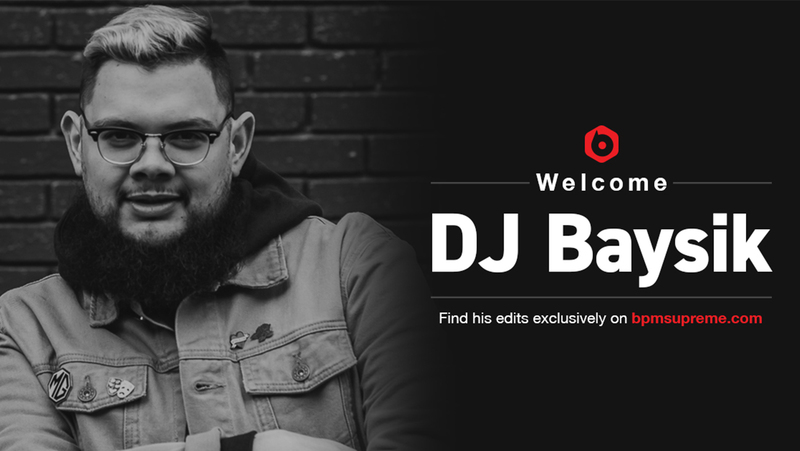 BPM Supreme is excited to announce DJ Baysik as the newest member to their exclusive team of editors and remixers. You can find Baysik’s edits ready for download on the BPM Supreme record pool. Baysik started his DJ career at the age of 13, with help from his cousin and mentor, DJ Quest. He credits Quest with teaching him everything from holding a needle to nightlife etiquette. With over ten years of DJing under his belt, this San Francisco native has gained support from top DJs locally and nationwide who play his remixes in huge arenas and on the radio. Baysik’s DJ name apparently originated from being a lazy student in school when a teacher told him that his work was ‘basic’ in front of his entire class. The word stuck with him and he eventually added a play on words using “Bay” because of his being born and raised in the Bay Area. It’s easy to see that Baysik is anything but lazy in his DJ career. He’s been nonstop spinning as a resident DJ for Rebel Pop Radio on Wild 94.9, as well as maintaining a residency at the Bay Area’s Sazon Libre parties. Baysik spins a mix of genres from hip hop to latin rhythms to moombahton. Be sure to download his latest edits and follow him on Instagram and Facebook.